In a bid to strengthen the friendly relations between Qatar and Bulgaria, His Highness the Amir Sheikh Tamim bin Hamad Al Thani and the Bulgarian President Rumen Radev held official talks at the Amiri Diwan yesterday. The two leaders reviewed Qatar-Bulgaria relations and engaged in discussions about new ways to boost relations across all domains, particularly agriculture, infrastructure, technology, education and complementary medicine. The Qatari-Bulgarian economic forum being held in Doha was also highlighted during the official talks between the two leaders. The forum is said to further bolster economic and trade relations between the two countries, reported Gulf Times. A number of regional and international issues of mutual interest were also part of the discussions between HH the Amir and the Radev. 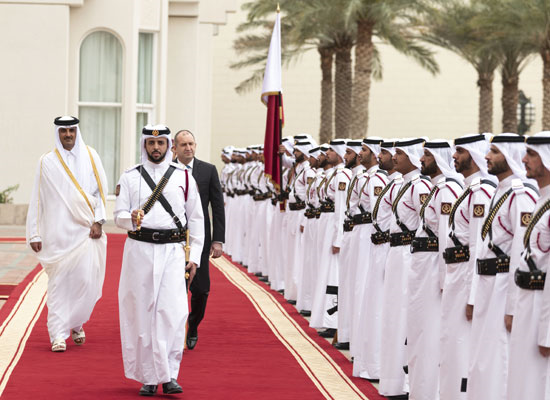 The meeting saw the attendance of some Qatari ministers and members of the Bulgarian President’s accompanying delegation. Later, a luncheon banquet was accorded to the Bulgarian President and his delegation by HH the Amir. The banquet was attended by a number of ministers. Yesterday, the President of Bulgaria and his wife Desislava Radeva also visited, among other places, Qatar Foundation, National Museum of Qatar, Museum of Islamic Art, Sheikh Faisal bin Qassim Al Thani Museum. Radeva also toured a number of health facilities across Doha. Earlier, the Bulgarian President took part in the Qatar-Bulgarian business forum, where he highlighted that Bulgaria and Qatar enjoy strong political ties and that the two countries are looking into ways to enhance those ties in the economic field as well, according to The Peninsula. He called for boosting Qatari investments in his country, pointing out that Qatar, which has considerable investment and resources, has sought to invest in major international countries and companies with proven results. However, he pointed out that GDP growth rate in those countries ranged from 1 to 2 percent, while Bulgaria's GDP growth is currently 4 percent, arguing that this should give the country a priority in terms of Qatari investments abroad. Radev called on Qatari businessmen to explore opportunities for cooperation with the 29 Bulgarian companies that are currently visiting Doha now, adding that the Bulgarian business sector was highly flexible and innovative, reported Qatar Tribune. Bulgaria is the European focal point in information technology, the President highlighted at the forum. His Excellency the Minister of Commerce and Industry Ali bin Ahmed Al Kuwari said that last year's forum in Bulgaria served as a significant opportunity to explore investment opportunities that are well-aligned with the interests of both countries. Bulgaria's Deputy Minister of Economy, Alexander Manolev, hoped the forum would benefit building economic partnerships between the two countries through launching successful initiatives in the business and trade sectors. He said that bilateral trade, which quintupled in the last decade, is not consistent with the level of political relations between the two countries. HE the Chairman of Qatari Businessmen Association (QBA) Sheikh Faisal bin Qassim Al Thani highlighted the Qatari investors' interest in exploring opportunities in Bulgaria which enjoys an open economy and a private sector that depends on industry, tourism, trade and services. He also called on the Bulgarian businessmen to benefit from the investment incentives that Qatar offers to foreign investors, and referred to the new investment law that allows 100% ownership in most of the economic sectors. Moreover, a memorandum of understanding (MoU) between Qatar Free Zone Authority (QFZA) and the National Company Industrial Zones (NCIZ) in Bulgaria was signed on the sidelines of the forum. The MoU aims at co-operation and exchange of expertise between the two countries in the management of free and industrial zones. Your thoughts on the story? Share with us in the comments below!